Lightning components consists of many resources as explained in below table. Component or Application sample.cmp or sample.app The only required resource in a bundle. Contains markup for the component or app. Each bundle contains only one component or app resource. CSS Styles sample.css Styles for the component. Controller sampleController.js Client-side controller methods to handle events in the component. Design sample.design Required for components used in the Lightning App Builder or Lightning Pages. 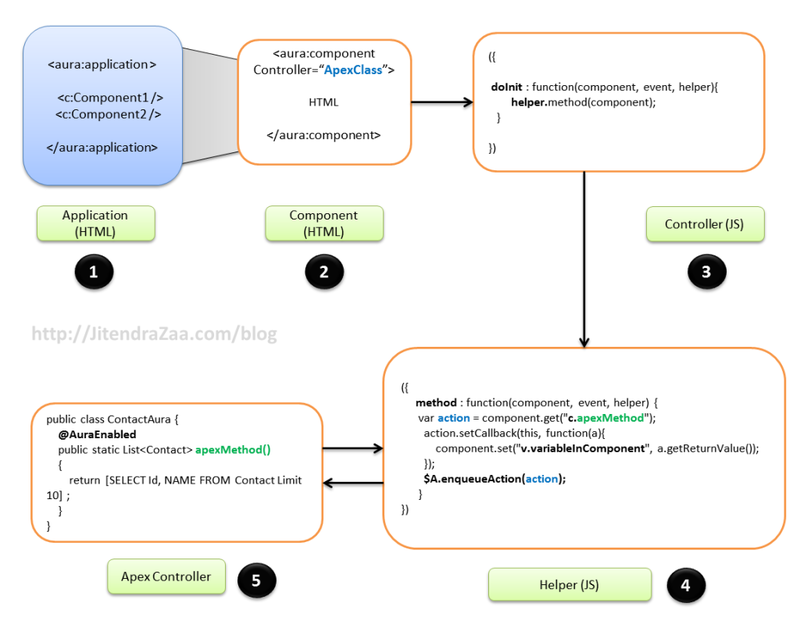 Documentation sample.auradoc A description, sample code, and one or multiple references to example components. Renderer sampleRenderer.js Client-side renderer to override default rendering for a component. SVG sample.svg Custom icon resource for components used in the Lightning App Builder. Lightning applications are standalone page, which contains many other lightning components. Its mark up is similar to HTML as shown in above image. To create Lightning application, open developer console, navigate to “File | New | Lightning Application”. It will prompt for “Name” and “Description”, provide proper information. This post is written in order of “execution flow” as depicted in above image. However, to save code in your Salesforce instance, you need to create it in opposite direction. So, basically you need to start with step 5. In above lightning application, I have used Bootstrap to style my application, saved in static resource by name “bootstrap”. This application has only one Lightning component named “AllContactsComp”. Lightning components can be created by navigating to “File | New | Lightning Component” in developer console. It can contain “HTML + Aura components” supported by Salesforce. As shown in above image, Lightning component consists of Controller ( JS ), Helper ( JS ), Style ( CSS ), Documentation, Rerenderer, design and SVG. We will be using only Controller and Helper in this post. Above component is using Apex class “ContactAura”, which I will explain in later part of this post. 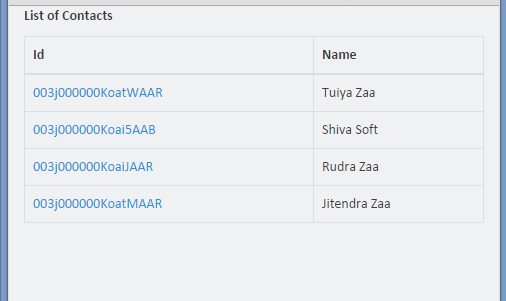 Attribute of type Object defined as name “contactRows”. Its calling method doinit() in handler file. “c” stands for “Controller” and “v” stands for “View” in Aura syntax. Later part of code is iterating over variable “contactRows” and displaying ID and name. We can click on “Controller” link available on right of component (image 2). It will create new file by name “[component]Controller.js” , in this case file “AllContactsCompController.js” will be created. this method “doInit()” is called by Component. This method is calling method in helper file. This helper file is calling method “get10Contacts” defined in Apex controller. After successful callback, it is setting variable “contactRows” defined in “View” of component. It is very important to enqueueAction so that it can be processed. 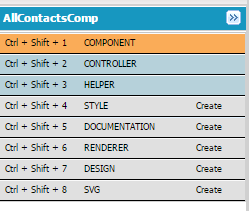 This apex controller is just querying 10 contacts to show on component. You can check final output by clicking on “Preview” on right of Lightning App file explained in step 1 of image. I would recommend to check this cheat-sheet by Salesforce for lightning components. Thanks for the blog. It was very informative. I had a question about app.css which is loaded by default and overrides the CSS of LDS (ui:button in my case). Is there a way to prevent that. Hi Manjit, I would recommend writing custom CSS in bundle of lightning component itself. Helpful blog. I’m customizing my napili template for business purpose . and hence have to redirect to /profiles/userid — > to utilise the standard functionality. to my url. kindly suggest. This is very useful to understand the basics of lightning, Please keep blogging about the lightning architecture. Pleas Can you tell me how to Crete below Lighting Component for page layout. 1. Create one custom object, add atleast one field with each datatype and add all fields in Page Layout in your salesforce dev org. 2. Create one lightening component that will show all fields from page layout and we can update those fields from that component. Awesome post about the basics of lightning.